Added levels to existing residential or commercial structures require analysis of all newly introduced loads to the existing structure as well as to the new structure itself. Vertical loads must be carried down to the existing foundation by exterior and interior walls. Reinforcement of the existing strip footings and pier footings maybe necessary. Where vertical loads are supported by existing walls and floors, reinforcement of these components may be required. Added wind loads may be carried down to both exterior and interior existing walls. Known as shear walls, these elements may need to be reinforced, or added. To achieve an efficient design that meets all the owner’s requirements, it is important that the structural engineer work closely with the architect. 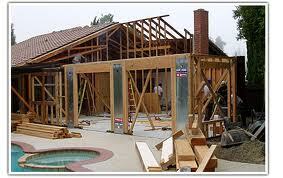 An addition is typically a newly built attached structure with a separate footprint. As such, an addition requires much of the same design input as an entirely new residential or commercial unit. Foundations, girders, headers, floor joists, and a roof system are sized according to codes and to material and span preferences. Where the old and new structures intersect, further design is necessary, particularly where openings are large.